I’m not really into Valentine’s Day, though I do love hearts. This heart nail art is quick and easy to do, but won’t be too in your face for Valentine’s Day. I first painted my nails in a mix of blues and purples. I couldn’t decide which color so I used them all in this ombre manicure. The hearts were inspired by …Love Maegan‘s nail art and I’ve also used the same technique on this simple heart manicure. 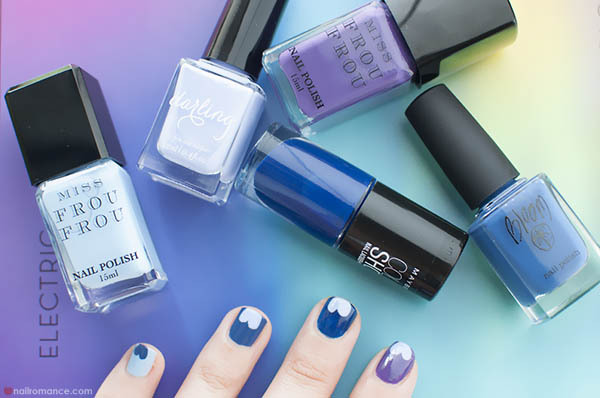 Using Hello Darling Dreamboat on the dark nails, and Bloom Emily Green Navy on the light nails, paint an X-shape that falls off the edge of your nails. I use this nail art a few days into my manicure as it’s a great way to cover up any chips or wear on the edge of your nails. Just paint one heart for a sweet feature nail too. Do you get into Valentine’s Day or do you play it a little more low key?